Today, Jordan Brand launched their XX8 Days Of Flight campaign. 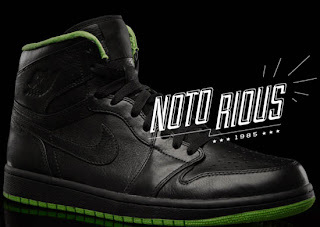 Kicking things off is a look back at the Air Jordan I. "The genesis of flight began with the Air Jordan I. A high-top cut that flew even higher on the feet of the league's Rookie of the Year. Break out your Air Jordan I's today and join us as we count down XX8 Days Of Flight here and on www.AJXX8.com"
They debuted in 1985 and twenty-eight years later in 2013 the Air Jordan I has become one of the most iconic sneakers of all time. It's no surprise that the Air Jordan I legacy lives on today with retro releases. We have seen a few release already with plenty more in store for the rest of 2013. Be sure to check out the 2013 Release Dates section for information on future Air Jordan 1 Retro releases. For now, enjoy the images below of this sample black and volt green colorway of the Air Jordan I made exclusively to celebrate the Jordan XX8 Days Of Flight Collection. Be sure to check out my Twitter @ajordanxi and Instagram @ajordanxi as I have submitted pictures of some of my Air Jordan I collection to share with everyone. You can also see them on the ajordanxi.com official Facebook page here as well.